Groundwater Management Area 12 held 19 joint planning meetings between 2012 and 2016 to review the Desired Future Conditions (DFC) for the aquifers under its jurisdiction. Environmental Stewardship (ES) attended 15 of the planning meeting and provided 13 separate written comments and requests during the review process. Links to Environmental Stewardship’s documents are found at the bottom of this page. A summary of Environmental Stewardship’s concerns and requests was provided to the Lost Pines Groundwater Conservation District Board of Directors and the Groundwater Management Area 12 District Representatives regarding the proposed Desired Future Conditions at the July 20, 2016, public hearing. Environmental Stewardship urged the Board and GMA-12 to1) adopt the Proposed Desired Future Conditions (DFCs), and 2) amend the adopting resolution to accurately state that the review process is not, and cannot be, completed until adequate tools and information are available. Therefore, the Proposed DFCs do not yet provide a balance between the highest practicable level of groundwater production and the conservation, preservation, protection, recharging, and prevention of waste of groundwater in the management area as required by Texas law. Since that meeting, GMA-12 has issued a DRAFT of the Explanatory Report required under Section 108. (d-3)(5) of the Texas Water Code . The report will be considered for adoption by the GMA-12 Representatives at the May 25, 2017 meeting in Milano, TX. The representatives will also consider re-adoption of a “corrected resolution” adopting the Desired Future Conditions for GMA-12. ES provided written response to the Explanatory Report in a letter and Annotated Response to the Explanatory Report dated May 18, 2017. As of this writing the “corrected resolution” has not been distributed for comment. Our comments on the Explanatory Report provide Environmental Stewardship’s concerns regarding the conclusions of the report and how our comments provided during the 2012-2016 joint planning process have, or have not, been dealt with during the DFC review and adoption process and in the report. 1) ES urges GMA-12 to adopt the Proposed DFCs. 2) ES, as a landowner, provided extensive written comments and requests to the GMA Districts on 13 separate occasions on the nine factors considered by the GMA-12 between July 25, 2013 and March 24, 2016 that were substantive and relevant to the nine factors. ES’ reading of 36.108(d-3)(5) does not distinguish the comments received during the entire review period from those received during the 90-day comment period and thereby leads to the expectation that these comments should have been, and continue to be, under the same standards of review. ES included these comments by reference in the comments provided to Lost Pines GCD during the final comment period and expects that they should have been included in the response to ES (Appendix R, pages 603-633). Section 36.108(d-3) states: The report must … (5) discuss reasons why recommendations made by advisory committees and relevant public comments received by the districts were or were not incorporated into the desired future conditions. ES Request 1: ES requests that the comments, recommendations and requests provided during the review period be treated with the same standard of review as those received during the 90-day comment period, and that responses be provided to these comments, recommendations, and requests. (Footnote 5). In its letter, ES acknowledged that a great deal was accomplished during this second round of DFC review and applauded the much more open and transparent process. ES also acknowledged the very professional and thorough work of the Consultants in providing scientific and technical information to the Districts to inform their policy decisions. In summary, It is evident from the Explanatory Report that a full and adequate consideration of several items was not possible because the tools, information, and time were not available to complete these tasks in compliance with Section 36.108(d). 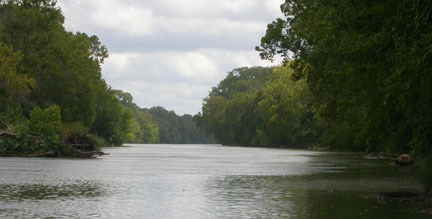 As such, Environmental Stewardship looks forward to participating in review and calibration of the Groundwater Availability Model improvements, and then the opportunity to use the science resulting to inform policy and technical decisions during consideration of the nine factors during the next round of review. Balancing between conservation and development of these resources. Since it is the duty of the groundwater conservation districts to protect the property rights of landowners like ES and others who want to conserve and preserve their groundwater in place for future use, non-commercial uses, sustainability, and environmental considerations, we look to the Lost Pines District and Board to adopt desired future conditions that truly balance between the conservation and development of groundwater resources (See Section A & B of ES comments). The Districts and GMA-12 have recognized and acknowledged their responsibility and duty to balance the use of groundwater resources between developing and conserving the aquifer in adopting desired future conditions (See Section C, Consideration 7 of ES comments). We also look to Lost Pines GCD to ensure that our concerns have been fully and adequate considered and that adequate and complete written responses are provided in the explanatory report demonstrating how our concerns were, or were not, incorporated into the finally adopted DFCs (See Sections A and B of ES comments). The Simsboro Aquifer Water Defense Fund, League of Independent Voters of Texas, and Neighbors for Neighbors signed on in support of Environmental Stewardship’s comments. The Colorado River at Pope Bend prior to intersecting the Carrizo-Wilcox Aquifer Group. Environmental Stewardship has but one interest in this GMA-12 DFC review process; to protect the integrity and functioning of the ecological systems that form the basis of the Colorado and Brazos river basins and the Carrizo-Wilcox and associated aquifers for current and future generations. 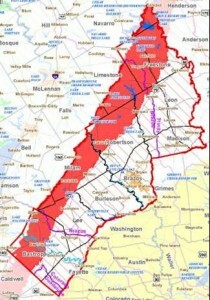 In conformance with the Conservation Amendment of the Texas Constitution, it is the duty of the Texas Legislature and Groundwater Conservation Districts to conserve and preserve the natural resources of the state — our groundwater, our rivers, our springs, and our ecosystems — by passing laws, rules, and for the purposes of this effort, adopting desired future conditions, that achieve a balance between conservation and development of those resources in perpetuity. To protect our aquifers as we found them while respecting the ownership rights of landowners. Though the ability to preserve an aquifer for future generations is not totally in our control — its rate of replenishment, and its hydrologic characteristics, are largely a function of Mother Nature and must be accepted and respected — development of an aquifer, and ultimate depletion of an aquifer and/or the surface water and ecosystems which depend on groundwater, is the voluntary human action in which we are currently engaged. The essence of conservation and preservation of an aquifer resource is that the rate at which we deplete our aquifers must be in balance with the conservation of the aquifer. That the depletion not be driven only by the desire for development, against which we simply wait for damage to the aquifer’s sustainability before attempting to bring it back “in balance”. Only as a bright “conservation standard” describing a sustainable aquifer is established — an aquifer that is preserved in perpetuity — can we then determine how much of that aquifer we can develop in balance with the conservation standard. Conservation and protection of an existing aquifer for the common good of future generations must be the priority, not the development of an aquifer to satisfy every current and speculated human demand on it. Civilizations that have disappeared have failed to realize this distinction when they exploited natural resources. ES challenges the GMA-12 districts to debate and adopt its own version of this conservation standard to guide in adopting desired future conditions during the next review cycle. 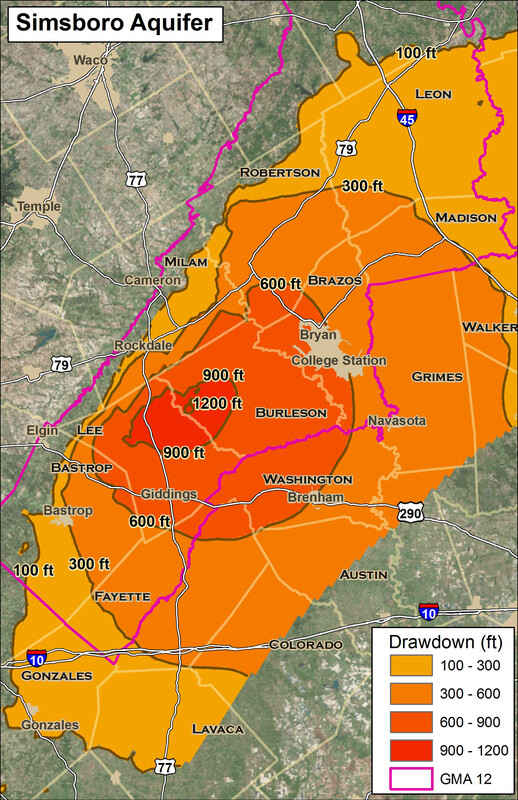 July 25, 2013 – Data and information regarding groundwater-surface water interactions between the Carrizo-Wilcox Aquifer Group and the Colorado and Brazos river basins. Attachment: George Rice, Affidavit and Report: Proposal to Pump Groundwater from the Simsboro Aquifer (Rice Report). December 12, 2013. March 27, 2015 – Review of predictive scenarios for comparison to adopted desired future conditions. Attachment 1a: Comparison of Modeled Available Groundwater (MAG) from adopted DFCs for GMA-12 Districts. Attachment 1b: Estimated Impacts of Baseline Pumping Compared to GMA-12 PS runs on DFC and MAG. Attachment 2A: Saunders, Geoffrey P. February 2006. Low Flow Gain-Loss Study of the Colorado River in Texas. TWDB Report 365, Chapter 19. Table 19-1 with calculations to convert cubic feet per second (cfs) to acre-feet per year. Attachment 2B: Saunders, Geoffrey P. February 2009. Low-Flow Gain-Loss Study of the Colorado river in Bastrop County, TWDB Report 374, Chapter 8. Attachment 2C: Rice, George. February 2015. Evaluation of Drawdowns Resulting from Baseline Pumping and Potential Pumping from the Simsboro Aquifer in Bastrop and Lee Counties, Texas (Rice Evaluation Report). August 6, 2015 – GMA-12 FORM: Comments on Needs & Strategies, Property Rights Presentation, and Supplemental comments on Hydrological Conditions. September 21, 2015 – GMA-12 FORM: Comments on Environmental Impact Presentation. October 6, 2015 – GMA-12 FORM: Request regarding Feasibility of Achieving the DFC Presentation. Please see Consideration 8. January 27, 2016 (dated 2015) – GMA-FORM: Environmental Impacts & Considerations Summary. February 4, 2016 – Letter: Summary of ES comments and recommendations concerning GMA-12’s DFC review. March 22, 2016 – GMA-12 FORM: Supplemental to Considerations 3, 4 & 8. March 22, 2016 Report: Rice, George. March 22, 2016. GAM Predictions of the Effects of Baseline Pumping Plus Proposed Pumping by Vista Ridge, End Op, Forestar, and LCRA. 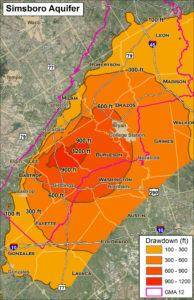 Report contains drawdown maps showing the extent of proposed pumping on individual aquifers and counties outside GMA-12 boundaries. May 18, 2017 – ES’ response to GMA-12 regarding Desired Future Conditions (DFCs) Explanatory Report for GMA-12 (cover letter). May 18, 2017 Report: Annotated Response by Environmental Stewardship on DESIRED FUTURE CONDITION EXPLANATORY REPORT FOR GROUNDWATER MANAGEMENT AREA 12 (DRAFT).